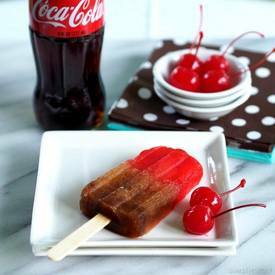 Cherry Coke Popsicles are just so darned cute I can barely stand it. Not only that, they taste great. I have been dragging my feet with this homemade Popsicle craze, but now that I have made these, my first effort, I’m sure I will be testing more flavors. Making them is just so much fun! One of my favorite drinks as a young teenager was Cherry Coke. I don’t mean the kind you buy already mixed, but the kind ordered at a soda shop – the kind where cherry flavoring is added to cola and garnished with a maraschino cherry. YUM!